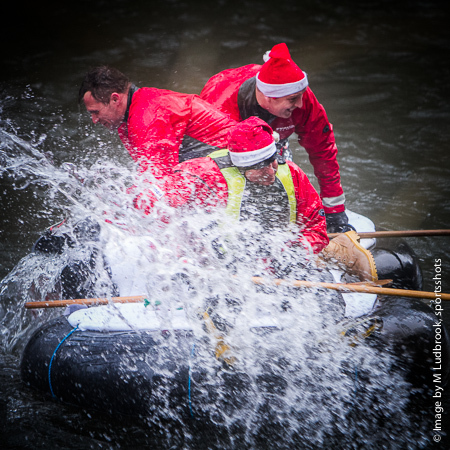 Matlock once again hosted the annual Boxing Day Raft Race event that takes a bunch of brave (yet slightly mad) teams down the river Drewent from Matlock through Matlock Bath and down to Cromford Meadows after negotiating the weir that is situated behind Arkwright Mill, a notorious raft breaker. 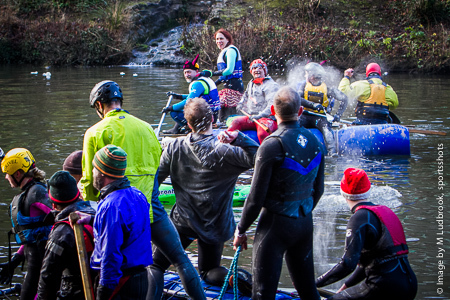 The run of approx 3 miles,winds its way through the Derwent Vally that provides a spectacular backdrop to the event. 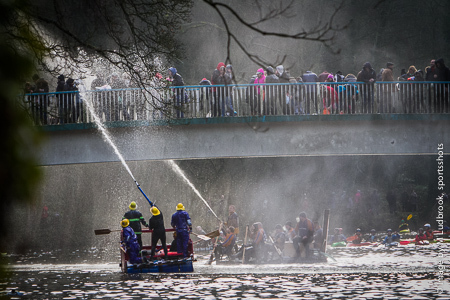 All this madness is supported by the crowd of thousands who line the route and support the rafters by launching flower bombs and buckets of water at them as they pass by. 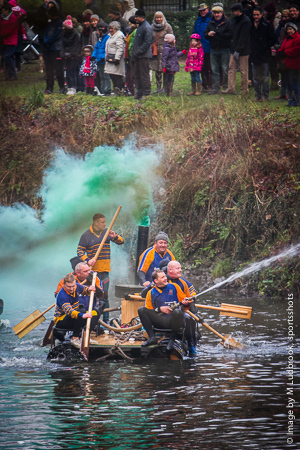 This is reciprocated with return fire from the rafts who over the years have developed some quite complex weaponry to retaliate with water not being in short supply high power water canons seam to be the favourite that manage to soak any spectator that is foolish enough to get themselves in the line of fire. 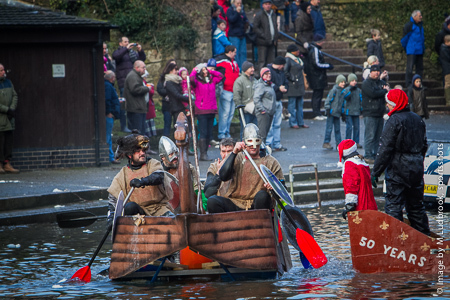 Of course this foolery organized by Derbyshire Association of Sub Aqua Clubs dose have purpose and each year the event raises money for the RNLI. 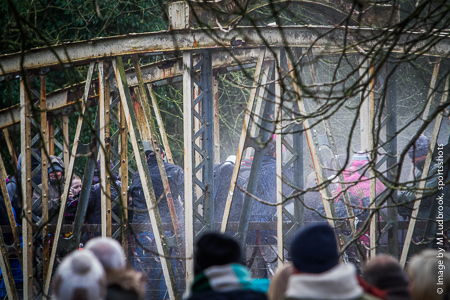 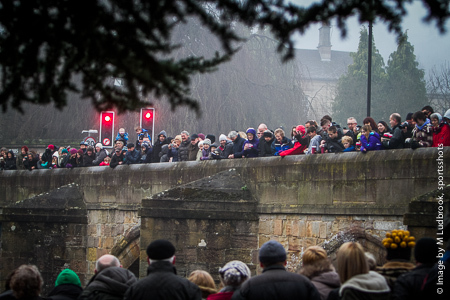 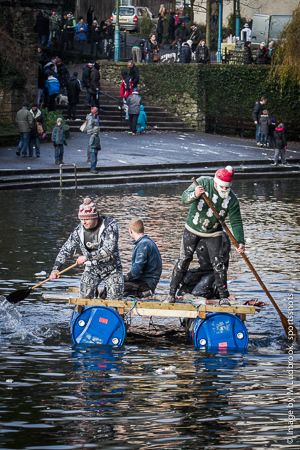 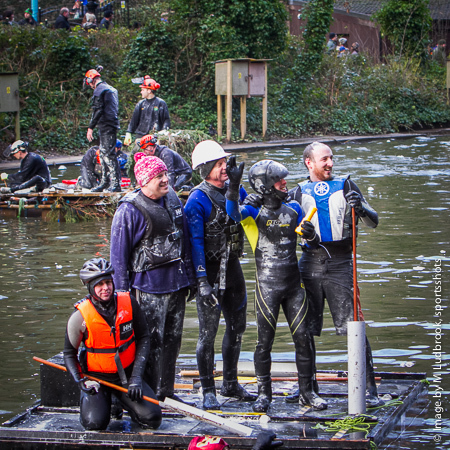 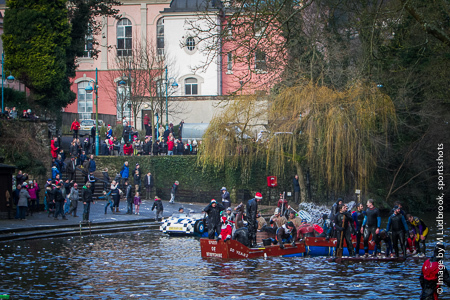 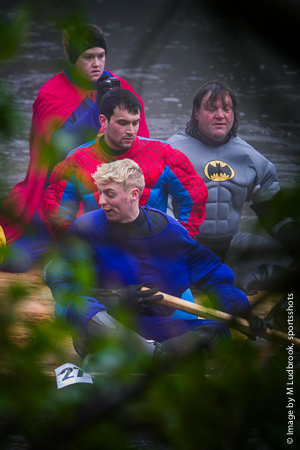 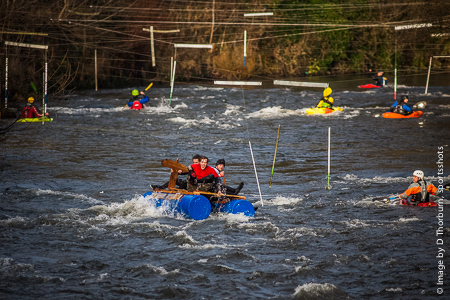 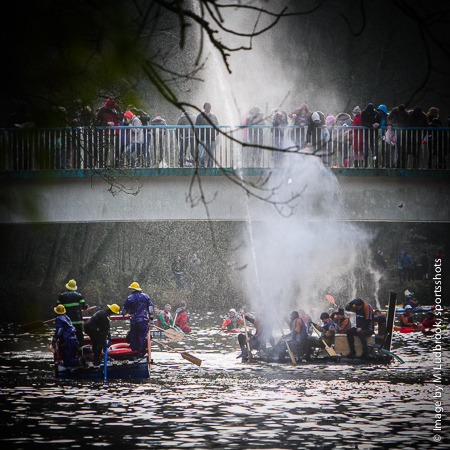 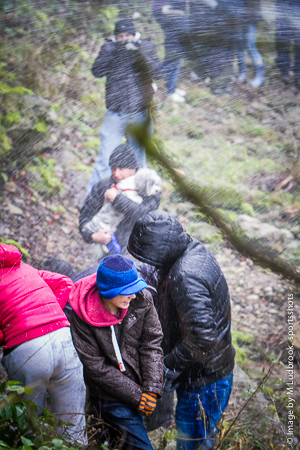 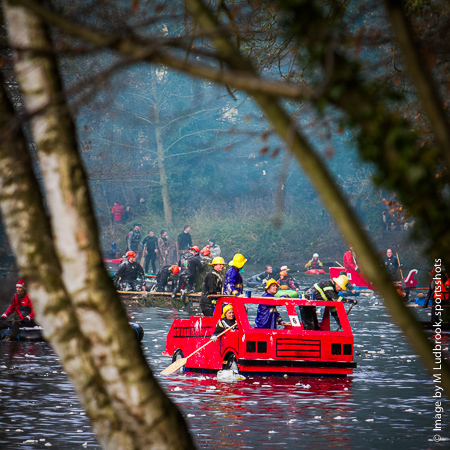 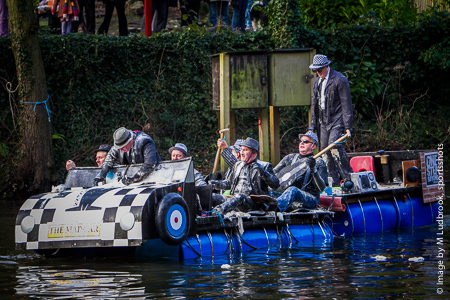 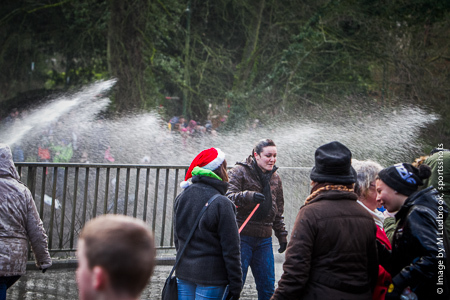 As 2012 draws to a close, echoes of a fantastic year of British sport reverberate throughout the country; however, all is not over quite yet, as Matlock hosts its 2012 annual Boxing Day raft race drawing crowds from far and wide to line the banks of the River Derwent. 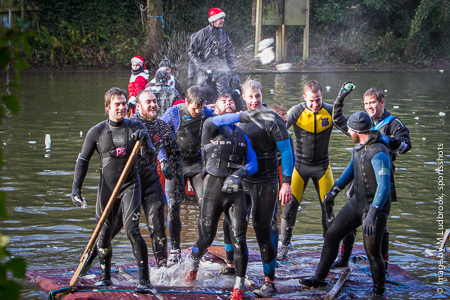 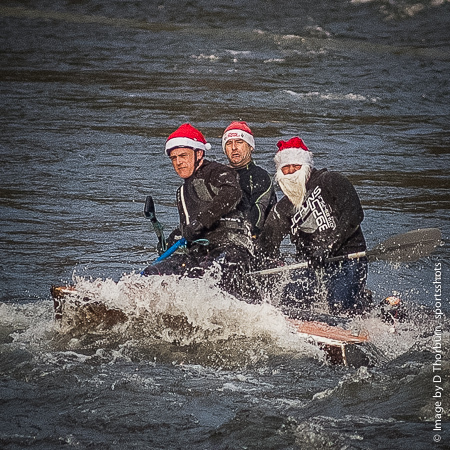 Some honorable and up-standing folk brave the winter chill, shake off the over-indulgence of Christmas day and come and cheer the valiant sailors of the rafts that bob down the river in all shapes and sizes. 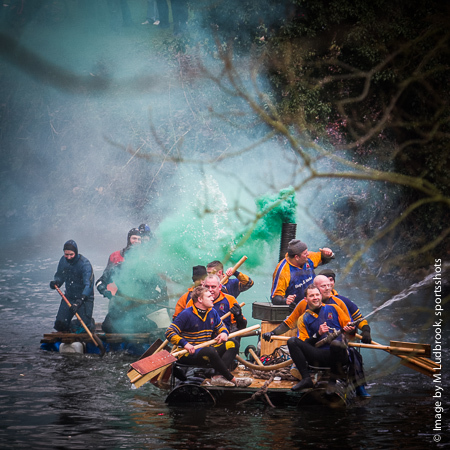 There are, however, other ‘less-than-savory’ scallywags who skulk in the shadows of the trees and on the bridges armed with flour bombs ready to do battle with members of the flotilla. 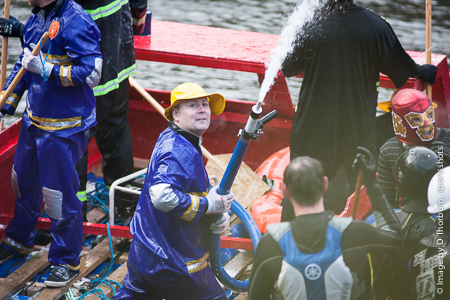 As Derbyshire got a break in the incessant wet weather for a few precious hours, the organizers looked to the skies and breathed a heavy sigh of relief as the numbers of onlookers build up along the waters edge and the collection buckets of the RNLI charity workers begin to fill. 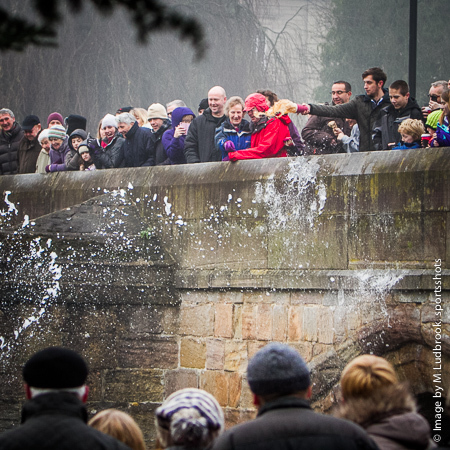 The church bells rang out at 10 am, as the strange array of crafts are gingerly lowered (or sometimes recklessly plunged!!) 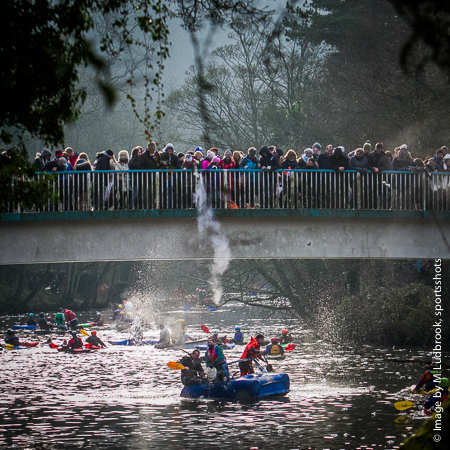 down the scaffold slipway just upstream from Matlock and the cheers start to build as the rafts begin to run the gauntlet down the treacherous 3 mile course, heading towards the finish at Cromford Meadows. 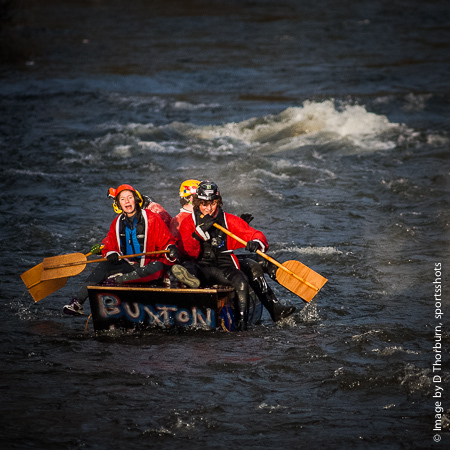 The brave men and women on board the motley collection of homemade vessels endure, not so much a race, but more a feat of survival as they try to stay afloat in the high and fast flowing waters of the icy cold River Derwent. 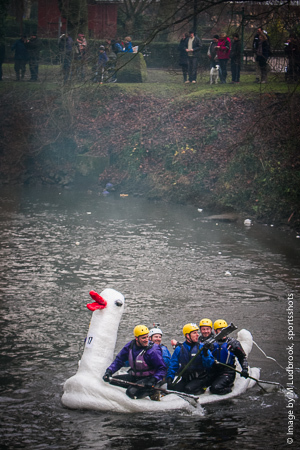 As they sail along the route, winding their way under the bridges they are subjected to an unrelenting barrage of flour bombs and buckets of water from the fiendish landlubbers stationed along the way whose sole purpose is to try to upend their targets into murky depths. 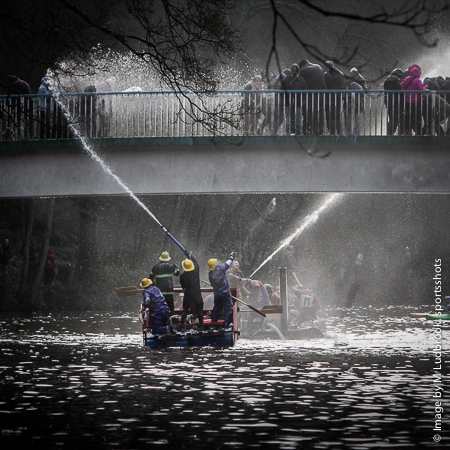 Not to be out done, the crews of these humble crafts are a canny lot and fire back with water cannon, buckets of water and flour bombs of their own. 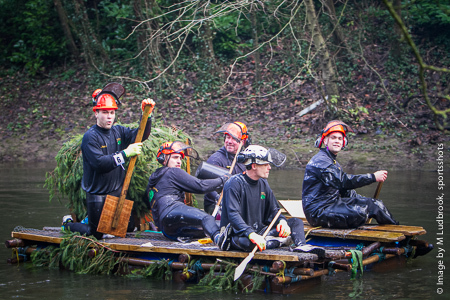 As the rafts enter the latter half of the course, these undaunted mariners have to contend with navigating rapids and the weirs, the turbulent waters of which try to tear the ram-shackled dinghies apart until the calmer waters beside Cromford Meadows are reached and the stout-hearted crews can look forward to a warming brew or a well-earned glass of ale! 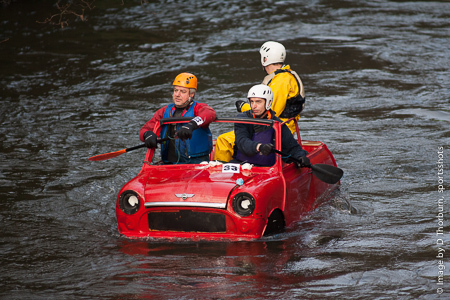 This fun event has now been running now for over 47 years and is organised by Derbyshire Association of Sub- Aqua Clubs, who, in total have raised more than £200,000 for the RNLI Lifeboats. 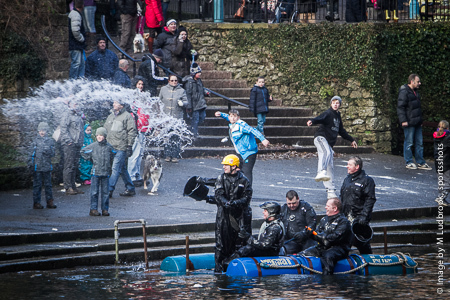 Next year SportsShots are looking to film the event. 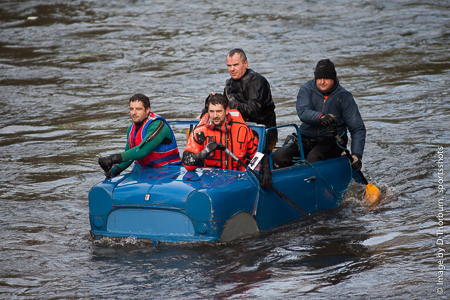 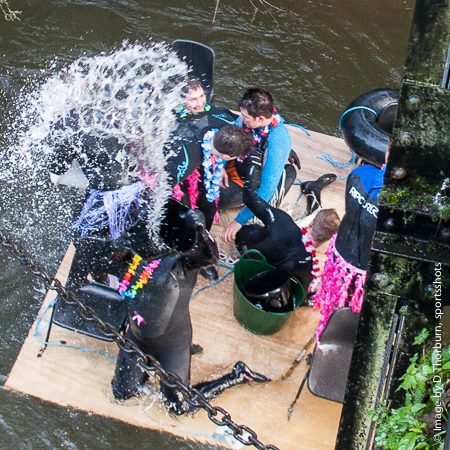 Should you be interested in running a camera on your raft then please contact us for more information?